Facade of single storey banking hall. 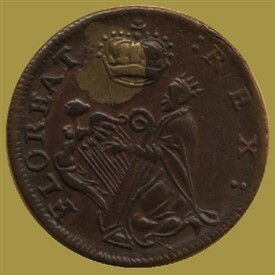 This early coin is a St Patrick's Farthing struck in Dublin sometime between about 1658 and 1670. It shows St. Patrick ridding Ireland of reptiles with St. Patrick's Cathedral in the background. The legend reads QVIESCAT PLEES - Alpha? One of the most tangible and visible reminders of Ballinrobe’s heritage is our historic bank buildings. 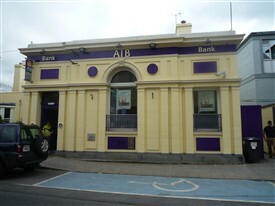 Since the 1830s, when Irish banks first began to open branch offices on a large scale, bank buildings have dominated the high streets of most towns across Ireland. According to Mayo County Council’s Listed Building register, no. 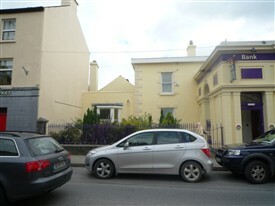 0068, this was originally a two storey rendered house, set back from the street line, with a three-bay single storey rendered banking hall built c. 1865 on it’s front site. The banking house fronts directly onto the street, with the remains of the former front garden site to the north side, bound by a plinth wall supporting cast-iron railing. 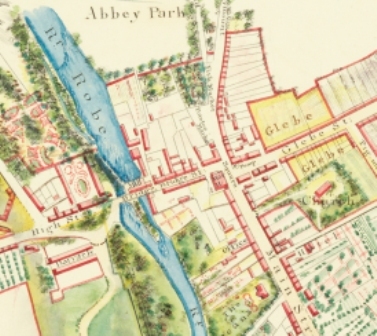 In March 1878 an article in the Ballinrobe Chronicle refers to the residence of Dr. Hastings Twiss being located here. Dr. Twiss had a seat at St. Mary’s Church of Ireland at the time, which would suggest that he was a wealthy Church of Ireland member. In a 1931 Trade Directory, the Munster and Leinster Bank is recorded, but no address is given. It is believed that Munster Bank Ltd commenced operations in 1864 in Ireland, purchasing some of the branches of an unsuccessful Union Bank of Ireland (1867). It also acquired the long established private bank, David La Touché & Son in 1870, but in 1885 it failed due to mismanagement and fraud and was liquidated. The Munster & Leinster Bank may have started in its new form and location on Main Street in Ballinrobe c.1922. It eventually became Allied Irish Banks Limited, formed in 1966 as a new company that had acquired three Irish banks: Provincial Bank of Ireland, Royal Bank of Ireland, and Munster & Leinster Bank. Before the inauguration of the Irish Free State on December, 6th 1922 six banks had the right to issue banknotes in Ireland. These six banks were named in the Bankers (Ireland) Act of 1845 and were: The Bank of Ireland, The National Bank, The Northern Banking Company, The Provincial Bank and The Ulster Bank (cannot confirm 6th at present). In 1926, the Minister for Finance set up a banking commission, to prepare a report on the changes necessary in banking and banknote issuing, in the newly formed Irish Free State. 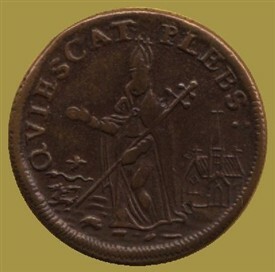 The result of the report was the establishment of an independent body called the Currency Commission, which was to manage the newly created Irish Free State pound which was fixed to the Sterling pound. Mrs. Catherine Clancy, the current Manager very kindly gave the name of the 1st Manager of the Munster and Leinster Bank in Ballinrobe as a Mr. J. J. Quinlan, who took up his appointment on 12th March, 1922. There have been 11 Managers including Mrs. Clancy up to Dec. 2010. Mrs. C. Clancy, Manager AIB & local sources. Mayo County Council’s Listed Buildings Register.